—I wish to respond to Patrick Garry’s article ‘Cá bhfuil mé? : Dublin’s Irish street names under threat’ (HI 13.3, May/June 2005). Mr Garry’s article primarily seeks to undermine the reliability of Irish forms of street names in Sráidainmneacha Bhaile Átha Cliath/Dublin City Streetnames, which was published by Dublin City Council in 2004. The Placenames Branch, Department of Community, Rural and Gaeltacht Affairs, was requested by Dublin City Council to assist in the provision of the Irish names. Our assistance is acknowledged in the booklet. Deirdre Kearney, Irish development officer of the council, wrote in the acknowledgments page that the aim of the list was ‘to introduce uniformity to the translation of streetnames in the capital, to eliminate incorrect versions of streetnames and to make addresses in Irish more accessible’. I believe that these are worthy and necessary objectives. The various examples of street signage which you have included in Mr Garry’s article, showing (often widely) divergent Irish forms of the same English name and illustrating many typographical errors and plain bad grammar (even under the guise of ‘an cló gaelach’! ), are ample proof of the need for such a list. In the HI article and in various letters and articles on the same topic elsewhere, Mr Garry gives prominence to the Irish name of Nassau Street, Sráid Nassau, which he states has incorrectly usurped Sráid Thobar Phádraig. Revd C.T. McCready’s Dublin Street Names (1892) is the standard work on the origin of the city’s thoroughfares. The author of that excellent book states that Nassau Street was so named in 1756 from a title of William III, ‘Count of Nassau in Prussia’. 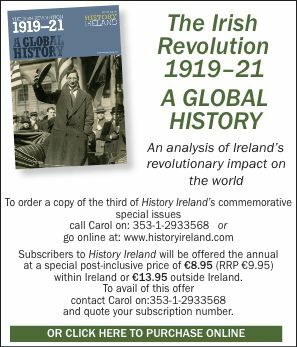 In our interleaved copy of McCready’s book, the entry was corrected by a well-known Irish scholar of the early twentieth century, Risteard Ó Foghludha, who quoted as follows from the Irish Press (1932): ‘Nassau was first used in 1749 when Lord Molesworth gave that name to the street in honour of his son Richard Nassau’ (whose birthday coincided with that of William of Orange). Other authors have also drawn attention to McCready’s uncharacteristic error. McCready also explained that Leinster Street, Lincoln Place and Nassau Street were all included in the earlier St Patrick’s Well Lane. A sub-committee of Dublin Corporation proposed in 1921 that Nassau Street/Leinster Street (amongst other street names) be altered to Tubber Patrick Street—Sráid Thobar Phádraig. The majority of these proposed changes in nomenclature were in fact rejected, as explained in an article by Bearnárd Ó Dubhthaigh in the book Sráidainmneacha na hÉireann (An Gúm, 1998). Therefore, as the identification of St Patrick’s Well Lane with Nassau Street alone is incorrect and as the change in nomenclature mooted over 80 years ago to Tubber Patrick Street was rejected, what purpose does the Irish form of the last-mentioned name serve, i.e. Sráid Thobar Phádraig, other than its avoidance of an eighteenth-century aristocratic name of foreign origin and its commemoration of a former holy well? With reference to the latter point, is the Irish-language version of a street name the appropriate means of commemorating such a location? If Camden (Street) was in fact derived from St Kevin or Caoimhín (earlier Caeimhghin), one would expect to find direct evidence of this. Can Mr Garry provide us with examples of this ancient place-name Port Chaoimhghin from which Camden Street mystically emerged about 1778? Mr Garry also finds fault with An Ché Adhmaid as the Irish for Woodquay. It was referred to as ‘the Wodkey of Dublin’ in 1451, and it more likely means ‘wooden quay’ rather than a quay located by a wood, in similar fashion to place-names in England such as Woodbridge (=‘wooden bridge’) or Woodchurch (=‘wooden church’). Therefore either An Ché Adhmaid, or Cé an Adhmaid, rather than Cé na Coille is the correct translation. The first of these Irish versions was already in use prior to the compilation of the booklet. Mr Garry refers to inconsistency in the Irish translations of names incorporating ‘the patriot dead’ such as Thomas Davis and Wolfe Tone. In fact, we followed what is by now established practice: Wolfe Tone’s name is generally ungaelicised in modern Irish-language school texts and other publications, while Thomas Davis is (correctly) translated as Tomás Dáibhis. Armstrong Street was named after a certain Richard Owen Armstrong in the late nineteenth century. The surname is generally considered to come from the Scottish borders. Although the literal Irish translation, Tréanlámhach, is found in Irish Names and Surnames by Revd P. Woulfe, it seems to be otherwise unauthenticated. Therefore Sráid Armstrong is preferable to the artificial Sráid Thréanlámhaigh. Mr Garry also makes the point that Slane Road ‘is now to be renamed Bóthar Bhaile Shláine’. The Irish name Bóthar Bhaile Shláine was already in use prior to the publication of Sráidainmneacha Bhaile Átha Cliath: it was included in a bilingual list of street names compiled by Dublin Corporation in 1996. Mr Garry is right in saying that Stannaway has been renamed Bóthar na gCloch. However, there is no need to grieve over the passing of Bóthar na Stainge, as we shall see. The following are some of the early forms of the name: stony wey (1296), le Stonyweye (1326), and—in what would seem to have been a contemporary description of ‘Stonywey’—‘The wey is double and at lee parke’ (Archbishop Alen’s Register). Mr Garry would have us believe that Stanaway is derived from ‘the styne, or stone, which stood here from medieval times’. Is there any proof that the first element of this placename was once styne (< Old Norse stein? ), prior to the historical evidence which I have presented, or are we in the realm of folk-etymology? The Irish word stang (genitive stainge) does indeed exist, both in place-names and in the lexicon. It is a borrowing from Middle-English stang, which comes from Old-Norse stong, meaning ‘a pole’. In Irish stang means a specific measurement of land, often regarded as the equivalent of a rood. Therefore Bóthar na Stainge, which would mean ‘the way/road of the parcel of land’, was—and is—an unsuitable translation of Stannaway. Mr Garry seeks to denigrate the Irish Bóthar Bhóthar na gCloch (=Stannaway Road), which he classifies as ‘mind-boggling’. As Stannaway exists as an independent place-name (a townland name), the modified name Stannaway Road should also be distinguishable in Irish; hence Bóthar Bhóthar na gCloch. Before signing off, I wish to briefly discuss one further street name whose Irish form Mr Garry claimed was incorrect in a Sunday newspaper, i.e. Palmerston Road/Bóthar Bhaile Phámar. I understand that Mr Garry’s objections to Baile Phámar are as follows: as Palmerston honours the memory of a particular individual, Henry Temple, former prime minister of Britain and third Viscount Palmerston, his title should not be translated, and that Bóthar Stiguaire (which one occasionally sees on Dublin buses) should be retained. The branch of the Temple family to which the prime minister belonged had lived at Palmersto[w]n, between Chapelizod and Lucan, since the seventeenth century, hence the origin of the title (see, for instance, History of the County of Dublin by F. Elrington Ball). However, shouldn’t one object on the same grounds to Cé Urumhan/Ormond Quay, as it refers to the duke of Ormond, and also to Cé Árann/Arran Quay, which was named in honour of the earl of Arran, and so on? The extinct place-name Te(a)ch (later Stigh) Guaire, which probably referred to a religious house, was located in the vicinity of Palmersto[w]n, near Lucan. It had been superseded by the latter name by the early thirteenth century (=‘Villa Palmerii’ ). Mr Garry claims that 20 per cent of the Irish names in Sráidainmneacha Bhaile Átha Cliath are incorrect. As I have demonstrated, the majority of the Irish names which he presented as erroneous in his article are in fact correct. The list of names in the City Council’s handbook is derived from Ordnance Survey Ireland’s Geo Directory. If there are omissions in this list, I am sure they can be easily rectified by Ordnance Survey Ireland.